The US authorities may move hundreds of prisoners from their controversial Guantanamo Bay prison in Cuba to the United States following new Supreme Court rulings, the Los Angeles Times has reported. The rulings granted the estimated 600 "war on terror",[scapegoats for the Coalition of the Killing's resource war's in the Middle East], detainees, [prisoners], at Guantanamo the right to take their cases before US courts. They have until now been kept in virtual secrecy and without being charged. Defence, [War], and Justice, [? Law], Department officials said they were considering moving the prisoners from Guantanamo Bay to a US military prison, preferably in a conservative judicial district, the newspaper reported. Keeping the proceedings in one jurisdiction would avoid moving prisoners and government lawyers to federal courts across the country, the report said. In a rebuff to, [war criminal], President George W Bush's post, [USA, CIA, reichstag, call to arms, false flag operation], September 11 policy, the Supreme Court ruled on Monday that US courts had jurisdiction to hear appeals by Guantanamo inmates, [prisoners], challenging their designation as "enemy combatants" ineligible for usual US legal rights. The Adelaide-based lawyer representing accused Taliban fighter, [scapegoat for the Coalition of the Killing's resource war's in the Middle East], Mr David Hicks says the latest comments by the British Prime Minister Tony Blair on United States military tribunals reflect badly on Australia. The Law Council of Australia has called for the Federal Government to ensure Guantanamo Bay inmate, [prisoner], Mamdouh Habib has access to a civil lawyer. The Pentagon has named the militants who will decide the fate of Mr David Hicks and two other Guantanamo prisoners charged by the United States in the first US military tribunals since World War II. 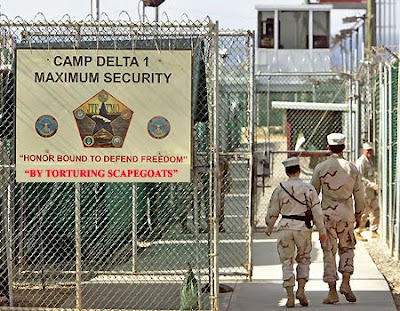 The US Supreme Court has ruled that US courts have jurisdiction to hear appeals from foreign detainees, [prisoners], held as enemy combatants, [scapegoats for the Coalition of the Killing's resource war's in the Middle East], in the US military base at Guantanamo Bay, Cuba. The lawyer for an Australian man detained at the Guantanamo Bay Naval Base has welcomed a US Supreme Court ruling permitting judicial appeals from foreign detainees held as enemy combatants. UK: The transatlantic rift over Guantanamo Bay deepened, as UK last Friday politicians and human rights activists seized on the attorney general's admission that, [war criminal], George Bush's plans for military tribunals were "unacceptable". On December 2, 2002, Rumsfeld approved the removal of clothing, 20-hour interrogations, the use of dogs to induce stress, 30-day isolations and deprivation of light and sensory stimuli (hooding). The Australian lawyer representing Guantanamo Bay detainee David Hicks has joined calls for the, [war crimial], Prime Minister to condemn interrogation techniques being used at the prison camp. US Defence Secretary Donald Rumsfeld, acting at the request of the CIA, ordered that a suspected Iraqi insurgent leader be detained off the books to conceal his identity from the International Committee of the Red Cross (ICRC), the Pentagon has confirmed. The United States is holding terrorism suspects, [? scapegoats for the Coalition of the Killing's resource war's in the Middle East], in more than two dozen detention centres worldwide, about half of which operate in total secrecy, according to a new human rights report. I hesitated to gravitate to harsher interrogation methods because, after all, he is my son. Then, [war criminal], Donald Rumsfeld came to my rescue. How much is that doggy in the prison? Woof, woof! Did the Iraqi prisoners' get their rations while they were treated like chums? The Australian Government was confident United States authorities in charge of Iraqi prisoners of war complied with the Geneva Convention, the Senate was told yesterday. London: Four British, [militants], will be court-martialled on charges of abusing Iraqi, detainees. The four Royal Fusiliers members are accused of assault, indecent assault and prejudicing good order.